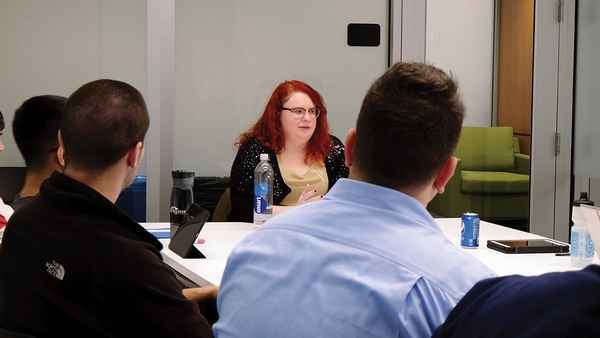 Medical students at the Univeristy of Louisville School of Medicine talk with local members of the LGBT community as part of the school's discussion sessions on issues LGBT patients sometimes face during their healthcare experiences. In 2014, the [University of Louisville School of Medicine] became the pilot site for the eQuality project, which incorporates the Association of American Medical Colleges' guidelines on LGBT health practices within their existing curricula. Louisville is the nation's first medical school program to address the healthcare needs of lesbian, gay, bisexual, transgender and nonconforming patients, as well as those with atypical sexual development—a community that experiences a large healthcare disparity. Those patients often avoid seeing doctors, meaning other diseases that could be prevented are left undiagnosed and untreated, said Dr. Amy Holthouser, associate dean for medical education at the University of Louisville medical school. The LGBT community as a whole has a higher uninsured rate. But many individuals also experience discrimination from providers, Holthouser said. That leads LGBT individuals to avoid care or delay it until their health suffers. LGBT adults tend to have higher rates of chronic health conditions than the rest of the population and LGBT youth are two to three times more likely to attempt suicide and experience homelessness. Gay men are at higher risk of infection with HIV and other sexually transmitted diseases while lesbians and bisexual women are more likely to be obese and less likely to be screened for cancer. The LGBT population as a whole has higher rates of smoking, drinking and substance use than the general population. The University of Louisville has been recognized as one of the most LGBT-friendly campuses in the nation by the not-for-profit organization Campus Pride. So it wasn't a surprise when its medical school implemented 50 new hours of training specific to LGBT health issues. The average, according to a 2011 study published in JAMA, is five hours total. Bisexual people face significant mental health issues. Now researchers know why. Can Turning Off Your Smartphone’s Blue Light Help You Sleep?